Organiser Sue Spence writes: "This year's UK reunion is the largest ever, and as at 19 August, 219 bookings have been made for dinner on Saturday evening and 146 for the Curry lunch on Sunday. The other events are popular too, with over 100 expected at the Famous Royal Naval Volunteer pub on the Friday evening ice-breaker. The tour of Harvey's Wine Cellars on Saturday morning has attracted 53 so far and 106 are going on the afternoon boat trip. There is still plenty of room on all these events for anyone who would like to join us. Unfortunately, the golf has had to be scrapped because of the inability to find a course which would host a party of guests on a Saturday afternoon. Those who have booked accommodation at the Marriott will be pleased to hear that after complicated negotiations the room rate has been reduced from � to �. This is the rate that should appear on the reservation card which you're given when you check in at reception." See latest guest list for Bristol. THE CITY of Bristol has been chosen for the seventh BI Reunion. Having visited the north in 2000 the organisers thought a move to the west country would offer a convenient venue to those living in that part of the world. They also had in mind Bristol's excellent road, air and rail links; London and Birmingham are about an hour away by train. Bristol has all the usual facilities of a major city. 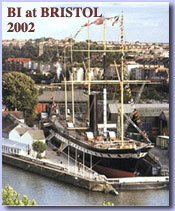 The harbourside area is delightful and a major attraction is Brunel's ss Great Britain and the Maritime Heritage Centre. If you visit the ship you may find the BISN Co plaque acknowledging the 1996 reunion's contribution to the replacement of its weather deck. The main events are to be held at the Bristol Marriott Hotel which is very conveniently situated in the city centre and is an ideal venue for us. Those at York will know we encountered a few problems with the hotel there. Happily, these are not likely be repeated in 2002 and we promise not to relegate the Chindwara/Chantala cadets to the lobby! The Marriott has excellent facilities and should be large enough to accommodate comfortably the growing numbers who are discovering the existence of the BI worldwide network. It has good sized function rooms, with plenty of foyer space for notice boards, displays of memorabilia and so forth, so that any special interest groups can set up their stalls and arrange their own gatherings. There is an ample bar and lounge area (which is likely to be very popular as a social centre throughout the weekend) together with a coffee shop, spacious bedrooms, a swimming pool, and convenient parking for guests in the NCP right next door. In York in 2000, for the first time, events were spread over a weekend: an organised boat trip on Saturday afternoon and traditional BI curry lunch on Sunday. All proved to be very popular and everyone seemed to appreciate the extra time available to spend with old friends. We抮e organising a wider range of events in 2002, including an informal 'ice breaker' at the Famous Royal Navy Volunteer pub. Also, if there is sufficient interest, we plan a visit to Harvey's of Bristol's wine cellars and a boat trip. In addition, Alan Myers has kindly offered to organise a golf tournament. All these are detailed on the events page. If you are intending to join us please complete the booking form (whether or not you intend to stay at the Marriott) and return it to me with your deposit of �.00 (which includes the £7 booking fee) per person as soon as possible. The final date for payment of the balances will be 31 August 2002 after which I cannot guarantee to be able to make any refunds because the hotel requires payment in advance. I will send out reminders in June 2002. To keep our postage costs down in future (and irrespective of whether or not you want to book for 2002) if you have an email facility will you please email mail@johnmspence.co.uk with the words "BI email address" as the subject. We will then use that address to keep in touch with you in future.